everyday I shall be posting a review about this classic horror series and lead up to the new 2010 remake. 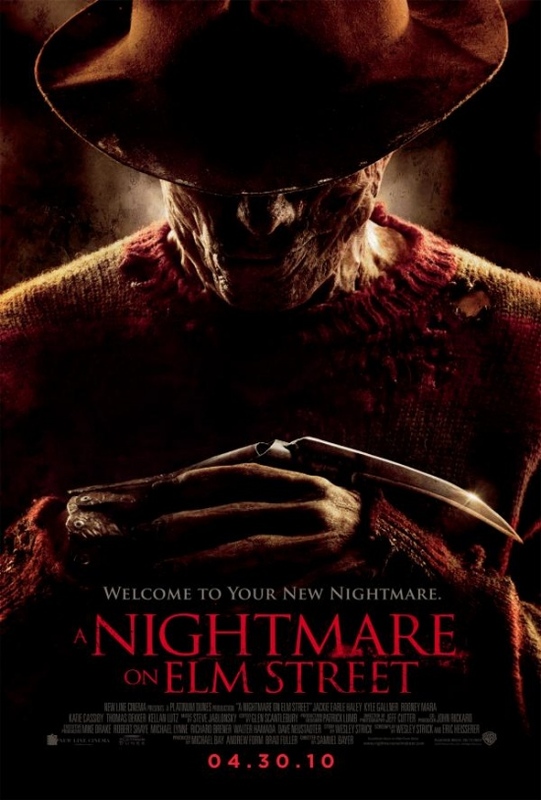 the first of course is "A Nightmare On Elm Street"
the first movie focuses around a girl named Nancy, who lives at 1427 Elm Street, Springwood (not springfield ) she continues to have a recurring nightmare of a man with a burnt face and a clawed glove. it's not until her friend alice is murrdered in her sleep that nancy starts to relise that her nightmares are more real then she thinks. the man's name is freddy krueger, a sadistic, witty killer from beyond the grave. freddy was a child murderer when he was alive, but the parents of the town killed him by burning him alive in the boiler room where he worked. freddy wanted his revenge on the parents, so he went after their children the only way they couldn't be protected, in their dreams. when nancy finds this out it is clear that if she doesn't wake up screaming, she won't wake up at all. Yeh the Freddy horror movies were good.. at the beginning, but like a lot of movies, they keep making to many of them, they should just stop after sorta 2 of them. this film takes place 5 years after the original, nancy has been sent away and a new kid has arrived on elm street and lives in the same room nancy did. this boy also has nightmares about a man with a clawed glove, but whenever he kills someone, it is the boy who does the killing. freddy is back and wants a new body so he posseses the boy and eats at his soul until freddy is back. will it be possible for the boy to over come freddy? or will his soul be devoured? i have only seen number one and was awesome. The first time i saw it i got scared. but question has anybody seen Freddy vs Jason? this film is set years into the future, nobody is living in the elm street house that plagued the nightmares of two teens before hand, but instead, a girl named Kristan is haunted in her own house and dreams by the demon of the hour, Freddy Kreuger. freddy's powers have improved and he's now able to control his victim's actions outside the dream, so long as they're still sleeping. he unintentionally forces kristan into a mental ward where she is met by others who have had the same face in their dreams and she meets an old face. Nancy is back and ready to take freddy on again. who will live? and who will die? "welcome to prime time b*tch"
when you see it can you please tell me what it is like? It looked awesome but i don't want to see it because it is probally really scary. "A Nightmare on Elm Street 4: the dream master"
with Nancy gone it is up to Kristan to keep her friends safe, but freddy is gone, isn't he? kristan can't defeat freddy so in a last ditch effort, she gives her power to a girl named alice. on by one, alice and kristan's friends are killed off by freddy, but where freddy takes their souls, alice inherits their powers, turning her into the dream master. but still, what will the out come be? "A nightmare on elm street 5: the dream child"
only with the help of freddy's deceased mother, can alice put freddy away for good? The cover art work on these movies is really great. and good info on the movies Bozo. "freddy's dead: the final nightmare"
it's been 10 years since alice and her new baby boy defeated freddy, since then they escaped elm street and were never seen again. but not all the children have gone, there is one more, the one to bring freddy out of elm street and into an new town and to defeat him once and for all. but is this teenage boy the final child, or is it someone else? this one doesn't take place on elm street, but in our world, the real world. when the woman who played nancy in the first and third movies starts to have nightmare about her friends dying by a new freddy, she starts to think that it may not be just a movie. she seeks help from the movie's creator, Wes Cravin, he explains that there was once a dream demon that took the shape of many things every other year, and that he took the form of freddy in the movies, but now the movies are over, the demon is free, but likes freddy's form and stays in it. the only way to defeat it, is for "nancy" to go into the dream world and kill him off with the help of her 5 y.o son who is also possessed by the demon. will they make it out alive b4 a real freddy kills everyone? there isn't much to say about the movie except the person who played freddy this time was the guy who played rorshack from the movie "watchmen"